Many women have reported that using bioidentical natural progesterone has improved the quality of their hair. It is thicker and glossier, but can it actually help with hair loss? Among the many changes of menopause that are not so welcome, many women are devastated to see the condition and quality of their hair undergoing a change. We expect to see some grey or silver hairs, to reflect the fact we have gained so much wisdom, but we do not want to see thinning patches or in more drastic cases actual hair loss. Such changes are part of the aging process but is more noticeable as women get into their 50’s as changes to our skin, eyes, joints and, of course, weight reflect the hormonal changes that are going on as women approach menopause. It can also be related to thyroid disease. When progesterone levels fall as a result of lack of ovulation, the body responds by increasing its production of the adrenal cortical steroid androstenedione. This steroid is an alternative precursor for the production of other adrenal cortical hormones. Androstenedione conveys some male like properties, one of which unfortunately is male pattern hair loss. There is also an everyday explanation: as we age, hair becomes a little finer and weaker, which leads to a flatness, loss of body and a greater tendency to split ends, causing a degree of frizziness. It can also be due to the effects of hair-care treatments, dyes and styling; particularly the habit of twisting or pulling your hair up into bands which break the hair. Maintaining good progesterone levels is a priority, as when its levels rise the androstenedione level will gradually fall and normal hair growth will eventually resume. It is not an overnight solution as hair growth can take 4-6 months for the effects to become apparent, but you can support the process by paying attention to diet and supplements. The first key element for healthy hair is to ensure a good supply of omega-3 fatty acids. Dietary sources include salmon, sardines and herring and you should try for at least two servings a week. If you don’t like fish then supplement with agood quality fish oil. Vegetarians, and everyone else, can also get a good source from flaxseed, which can be ground and sprinkled on cereal or salads. The second super supplement for healthy hair is GLA (gamma-linolenic acid) and an excellent source is evening primrose oil. Mary we cannot answer that here so please send this to support@wellsprings-health.com so they can help you, but it is impossible to overdose on bioidentical cream hormones. They are entirely safe and free from side effects or withdrawal symptoms. Hi there. I have a couple of queries. I’ve been using the bioidentical progesterone cream for a while now. The 1st month I seemed to really improve. Then following the instructions I stopped for 6 days. So symptoms came back with a vengeance! 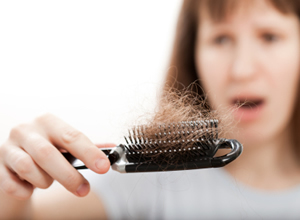 Hot flashes, migraines, more hair loss. I’ve continued with the cream but no further success. I asked my doctor about the 6 day pause and he said to go straight through. Now I’ve actually doubled the amount of cream and using every day. I’m hoping this will bring more relief.